Relations between Russia and the European Union should set clear long-term objectives, and the EU should stop using the friend-or-foe principle in dealing with Russia, says Russia’s Foreign Minister. In an article written for Russian daily Kommersant, Foreign Minister Sergei Lavrov takes on the issue of EU-Russia relations, particularly surrounding Ukraine. He points out that 2014 is a good time to remember what can happen when diplomacy fails: this year, the world will mark the 25th anniversary of the fall of the Berlin Wall, the 75th anniversary of the outbreak of World War II, and the 100th anniversary of the outbreak of World War I. In his op-ed, Lavrov argues that today, the principles of democracy and market economics have become universal across the Euro-Atlantic region and as a result, Europe should serve as a model for the rest of the world. However, Lavrov warns that there continue to be issues between East and West that could lead to serious conflicts. 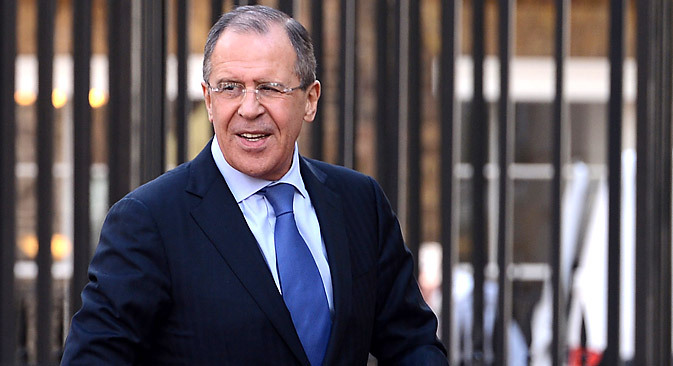 RBTH rounds up Lavrov’s nine key messages. Western mass media are deploying an anti-Russian information campaign using phraseology of “cold war” times. The situation in Ukraine is the focus of disputes in the European media space. The issue of conclusion of the Eastern Partnership Association Agreement with Kiev, which was prepared within the framework of the EU Eastern Partnership programme, has become a bone of contention. The authors of the Eastern Partnership initially assured us that this project has no confrontational component. However, they soon started to bring this question up with our joint neighbours with the European Union: you should decide who you are with – Europe or Russia. Such an approach is contrary to the logic of the actions aimed at erasing dividing lines in Europe, which is formalised in OSCE documents; it looks like another round of attempts to move these lines to the East. We have always clearly and consistently believed that the choice of the spectrum of its development, the resolution of the question about being part of these or those integration structures, is a sovereign right of every state. We understand that integration can be strong only when it is based on mutual interests. We expected that our European partners would demonstrate the same respect for the freedom of choice of the Ukrainian people. We were unhappily surprised, when it turned out that in the opinion of the EU’s and the United States’ representatives the “free” choice has already been made for the Ukrainians and it means “European future”. At the same time, the considerations that Ukraine should repeat the path taken by Poland and other countries of Eastern Europe, seem to be incorrect: nobody is offering Kiev any real prospects to accede to the European Union, it is a question of unilateral adoption of the rules dictated by Brussels, including the full removal of barriers for the EU’s trade expansion. The situation, when the process of democratic will is replaced by “street democracy”, when the opinion of several thousands of protesters attempting to influence authorities by force is claimed to be “vox populi”, cannot be acceptable. A sweeping situation in a state in the centre of the European continent can hardly be in anybody’s interests. We cannot fail to see that the actions of anti-government forces in Ukraine show traces of nationalist and extremist moods, the anti-Russian rhetoric of certain circles is aligned with anti-Semitic, racist appeals. The attempts to turn a blind eye to this, aspiring to put the picture inthe template framework – “good” opposition against “bad” government – are short-sighted, the same as ignoring reality and underestimating one’s own problems, including those in the area of interethnic and interreligious relations. In this regard an Eastern wisdom comes to mind: people who live in glass houses shouldn’t throw stones. At the same time, the European Union still tends to create ties with its neighbours exclusively on the basis of making these countries closer to EU standards and by taking its lead from the politics of Brussels. However, Russia’s goal is not to accede to the European Union, and therefore cooperation between the two largest players in the European space can only be equal. The partnership potential between Russia and the European Union is tremendous. We share complementarity and interdependency of economies and common cultural roots. Russia satisfies one third of the EU’s oil and natural gas needs, almost one fourth of its needs for coal and petroleum products. There is no other partner like this, who would be able to ensure stable supplies in the necessary amounts. 9. Who should determine shared values? I cannot disagree that common values should be used as cement when constructing a common European home. However, we need to agree what they are like and who determines them. We believe that value landmarks should be a product of mutual consent rather than an invention of any one state or group of states. I would like to recall that the principles of democracy primarily envisage respect for others’ opinion. This article has been abridged. This is unofficial translation. The original Russian text can be read here.